There has never been a U.S. President like Donald Trump. It’s not his history, his ideologies, or even his style that make him completely unique. All of these traits have precedents in some form or fashion. The one thing that truly makes President Trump different from every other President before him is his ability to make mainstream media look like absolute fools. Journalists have always had the upper hand. When they had a President they didn’t like such as George W. Bush, they could selectively pick out quotes that made him look silly while aggressively examining his missteps with a microscope. When they had a President they liked such as Barack Obama, they could just hang out with the guy and fawn over his clever quips. With Trump, the media is tripping all over themselves, falling flat on their faces in the process. They seem to finally understand that Twitter is where they’re going to get their “sound bites” instead of directly from the mouth of the President. This is the only positive in the eyes of the media to having Trump as President. Everything else makes their jobs not only harder but potentially dangerous. We’ve seen disinformation coming from the administration that essentially puts the media on notice. They fell hard for reports that the National Guard would be turned into a deportation force. Only after reporting the memo did the administration come out and say it was false despite attempts to verify it before the report. This was done specifically to promote the administration’s narrative that mainstream media posts fake news constantly. More recently, we saw the President himself act as a “senior administration official” to leak a story that he “envisions a bill allowing many immigrants to stay in US.” The motivation behind this one was even funnier. He wanted to get press coverage before his big speech before Congress so he’d have more eyeballs watching. I mention his penchant for disinformation first because it’s not new to the office. Every President tries with various degrees of success to manipulate the narrative. Some say Obama was great at it, but let’s remember that the press were willing victims in many cases when the last administration wanted to shift perspectives. Bush43 was awful at it (though some in the administration were decent). Bill Clinton was masterful. Bush41 barely even tried. Ronald Reagan was arguably the best in modern history… until Trump. This is part of the game that must be played in Washington DC. The press knows it. Their thirst for a scoop often supersedes their desire for the truth, so they’ve always played the game and hoped to come out on top as often as possible. With Trump, they’re quickly being taught (though likely not learning) that his administration has the upper hand. With that important piece out of the way, let’s look at the thing that makes Trump unique. Most pundits are aware that President Trump is pushing the narrative of mainstream media being loaded with fake news because he doesn’t like them. That’s only half the story. The other half is more nefarious and must be watched carefully by both sides of the political aisle. Trump doesn’t just want the mainstream media to look bad. He wants them eliminated. He wants them replaced. The easiest way for his agenda to be successful and his next term to be secured is if he can make the people disenchanted with the press itself. He’s known this for years and has discussed manipulating the media since the 1980s. The difference today, as president, is that Trump realizes they will never be on his side. He could make Barack Obama his personal adviser and start initiating leftist policies and they still wouldn’t like him. The leftists press aren’t as concerned with his policies as much as they’re concerned with the man himself. They hate him. As a result, he’s going to eliminate them as much as possible. 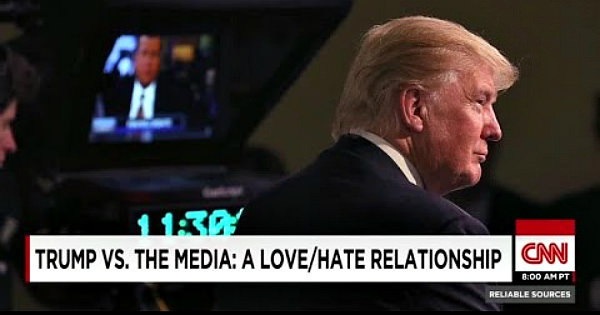 Past presidents have had contentious relationships with the media, but Trump is going to continue to push the bounds far beyond anything we’ve ever seen. He’s making the relationship personal and relying on their unhinged desire to destroy him so he can paint them as dishonest and “enemies of the American people,” as he once declared. What the press doesn’t seem to understand is that he’s winning this war. They’re still playing the game as if it’s them versus him. He’s playing the game as if it’s them versus America. Over time, he’s going to win this battle. That’s the good news. As someone who has had an issue with mainstream media for decades, I cheer his efforts. The only thing that concerns me is that he seems to be pushing to not only eliminate them but to replace them with his own people. Anyone who thinks he has Steve Bannon so high in the administration because of Bannon’s political know-how doesn’t get it. Yes, Bannon knows politics, but he knows the media better than just about anyone. For the sake of space, I’ll wrap it up, but there’s so much more to explore on this topic. We’ll cover it further on Thursday. In the meantime, be mindful that President Trump is going to continue his attacks on the media and there’s nothing they can do about it. Every day, the media loses credibility. Every day, President Trump gains new sympathizers who are sick of how mainstream media paints the administration and anything associated with Trump. Even the left is starting to notice the bias. As improbable as it sounded a few months ago, Trump’s war with the press is going to pay off. Their hatred for him will demonize them in the eyes of the people.